Children dream of a white Christmas, or even just a simple snow day, and with reason. They jump at the chance to build a snowman, go sledding and generally prance about in the snow. For the young at heart, these are all enticing prospects. For those tasked with clearing away snow, it is a much less jovial scenario. Shovelling snow is a very physical task than can take a considerable amount of time, particularly if an area has had heavy snowfall. Not only is physical exertion a factor when clearing snow with a traditional shovel, the strain on the back and arms can take a serious toll. In addition, fatigue often leads to slipping and injury. This is particularly the case when clearing a larger drive or pathway. Things get even worse when an area is hit with repeated snowfall over a longer period of time. Cold is also a factor and prolonged periods of time spent in the low temperatures lead to discomfort or worse. As a response to the inherent struggles of clearing snow, manufacturers have come up with a novel solution to make the task a whole lot easier. The shining beacon of hope for all snow shovellers out there is the electric snow shovel. Using the power of electricity, this type of snow shovel significantly reduces the effort required to get a space clear and safe from snow. What is an Electric Snow Shovel? An electric snow shovel sits at the crossroads between a manual shovel and a heavy-duty snow blower. It is basically a conveniently sized alternative that takes up much less space than larger, and more expensive, industrial-sized blowers. They also use much less power and are easy to steer thanks to their low weight that is often lower than two dozen pounds or so. The size factor is important because electric snow shovels can be stored indoors in a closet or alcove rather than in a garage. This is particularly convenient when you need to begin clearing straight from your front door. No more pesky traipsing through snow to the garage to get the blower out. Manoeuvrability is definitely a defining characteristic of electric snow shovels. They are designed to be used by most people with ease, even older users who may not have the same physical capabilities as they used to. Technically speaking, an electric snow shovel borrows its basic functional concept from the snow blower. A vertical helical shaft, or augur, removes the snow from the ground and ejects it at a distance, clearing the desired area in the process. The difference is that the power and capacity are reduced to suit smaller and medium sized jobs that suit homes and very small business properties. 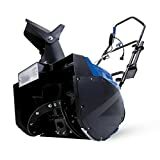 For larger areas like commercial buildings where snow depth exceeds around six inches we do recommend a snow blower because an electric snow shovel lacks the power to complete the job efficiently and speedily. Conversely, a heavy-duty blower won’t be able to reach smaller areas in and around homes and gardens. Think stairs and pathways leading to and from a house or garage. Another characteristic of electric snow shovels is that they are powered by electricity rather than the gas typically used in snow blowers. Once again, this provides another level of convenience negating the need to obtain gas from a gas station and to maintain an intricate engine. Essentially, it is a convenient device used to clear snow efficiently. The following features are pretty standard specifications on most models and can be used to determine the utility of an electric shovel based on your personal circumstances. They can also be used to measure the general quality of a model by acting as indicators of its overall ability and usefulness. Cutting depth determines how much vertically amassed snow an electric snow shovel can handle comfortably. Put differently, it determines how deep the shovel can work. Most models have specifications that gravitate around six to eight inches. Anything less is not really effective enough and is better suited to areas with sporadic snowfall. The same applies for areas that are consistently under snow for large portions of the winter. It is important to remember that electric snow shovels are geared for medium snow levels. We therefore recommend taking note of the shovel’s cutting depth before purchase. Ensure it is suitably deep to work in your particular situation and is able to handle an entire winter season confidently. Remember that a larger cutting depth usually correlates with a higher price so you should keep this in mind if cost is a consideration. Clearance width determine the size of the blade that cuts into the snow. In other words, cutting width determines the horizontal span of the shovel and how wide the shovel is. This is linked directly to time spent clearing snow. In theory, the larger the clearance, the less time spent outdoors working the snow away. If you have a larger area to clear, a larger width is recommended. Less passes are required with a larger width. Clearances are generally available in the zone of 12 to 18 inches. If you have a great deal of small, awkwardly shaped zones to clear, a larger width may prove detrimental and in this case opt instead for a smaller, more nimble width that is more versatile. Think how manoeuvrable a shovel is based on the clearance width. The basic premise of an electric snow shovel is that it removes the need to lodge a shovel under the snow then hoist it into the air to move the snow away. The snow throw distance determines have far a model can fling the snow, but also the pattern in which it does so. A model that clears the snow efficiently, yet moves it to a location in proximity is essentially useless. Furthermore, a model that sends snow spiralling in the air only for it to settle back down onto the path you just cleared is a waste of time and effort. Accepted throw distance among most models is somewhere between 20 and 30 feet. When considering power we aren’t referring to the capacity of the motor. Instead the design of the augurs is far more important. Though you won’t be able to break open a shovel to analyze its inner workings, it is possible to find shovels with dual augurs for example. Price usually determines the efficiency of the augur. This is measured in pounds of snow moved per minute. The higher the number, the more snow is shifted. Most models are around 300 pounds per minute. Next up is the power source. Cordless models are great for manoeuvrability because you don’t need to worry about having a sufficiently long cord. They do, however, cost more for the luxury. Look for models that are power efficient with a low recharge time. Aim for 45 minutes and above to ensure you have sufficient time to rid the affected area of snow with some leeway. Charge times around 30 minutes are convenient though longer are acceptable if you charge overnight. The type of motor will have an impact on the battery capacity. Look for more efficient motors like brushless versions rather than high-amperes models which are more power hungry. For corded models, avoid models with detachable cords that are not secured in some manner. They can remove themselves from the socket if you stray to far from the walk socket, unceremoniously cutting off the power, forcing you to halt your clearing to plug it back in. In addition, you can find models where the cord is fixed to the shovel via a locking mechanism. The weight of an electric snow shovel determines is manoeuvrability as well as its portability. Look for models within the 10 to 20 pound range for convenience. If you are of reduced mobility or lack physical strength, opt for something lighter. Note that in general a lower weight means less power. Furthermore, a lower weight shovel is easier to carry around and store. Consider this if you are in an area with constant levels of snow that may require daily use of the shovel. Ergonomic design makes using an electric snow shovel an easy task whilst one that requires you to arch your back defeats the point and you might as well use a traditional shovel. Look for models with long handles that are designed for good postured use. Handles that are sturdy, well made and shaped for comfortable help ward off injury and fatigue. In essence, you want a shovel that requires the least amount of physical strain possible, yet yields the most power when shifting snow. This particularly relevant in snow prone areas where removal of snow is measured in tons. Ideally, find an adjustable handle stem so you can find the perfect length for your height and build. Multiple handles are also recommended for those extra tenacious bits of snow just above ground level that require two-handed use of the shovel to obtain the best clearing result. These are more suited to personal preference, yet may be exactly what you are looking for. These range from rotating chutes, to the inclusion of wheels to facilitate movement, through to headlights mounted on the shovel for visibility in reduced sunlight or when it is snowing. Our budget pick is the Snow Joe 324E. To clarify, this is a model suited to those who don’t have much cash to spend and want a shovel that works better than a traditional one, yet lacks some of the power and efficiency of pricier models. As with any low cost product, corners have been cut. We found the 324E to be the best compromise between quality and cost. The 324E is perfect for small jobs like stairs leading to a home, decking and narrow paths. It sports a 10 amp motor that is sufficiently powerful to clear an impressive 300 pounds of snow per minute given the size and cost associated with this model. The throw distance is about 20 feet though the chute isn’t adjustable so the snow will always fall in roughly the same direction. This may be troublesome if you are working a long path as you inevitably end up shifting some of the snow you had moved only minutes before. The augur is paddle shaped and has two blades. It is made of plastic and isn’t the most durable, but this comes with the price range so is expected. The cutting depth is six inches and will tackle a reasonable amount of snowfall. It may not prove sufficient for blizzard prone areas, though you can first take off the top layer then work your way down. The clearance width is 11 inches so small enough for those oddly shaped areas and large enough to not make a tedious meal of a long path. The design is lightweight and compact at a mere 13.6 pounds. The handle is Snow Joe’s patented back-saving design to minimize strain. For convenience, it has two LED lights mounted on the front to ease clearing at night or in low lighting in the depth of winter. It doesn’t ship with a cord so you will need to source one yourself. It does, however, have a cord hook for security and an adjustable length handle via a joint-fixing knob and bolt system. We also liked the safety switch that must be engaged for it to power on. The instant start power button makes using the shovel very straightforward. The second handle on the stem is a welcome feature as it allows double handed gripping for harder snow patches. Overall, the 324E is easy to use, designed simply and comfortably. The drawbacks are bothersome, but not enough to put us off the model. As above, it is definitely an entry-level model; however, it does the job well for the price. Within the convenient range, we feel a mention of the Toro 38361 Power Shovel 7.5 Amp Electric Snow Thrower is required. It runs off a 7.5 amp motor that is ideal for small areas and around the garden, on paths and surfaces. The power curve technology motor can clear a standard 300 pounds per snow a minute and Toro claim it can clear a medium sized driveway in under 20 minutes. Snow is thrown up to 20 feet away though the chute is non directional so as with the 324E be wary of the direction you are pointing. The streamlined augur drive system consists of a single rotor with two plastic blades that aren’t the most reliable, but function well enough for the price. It can cut to a depth of six inches per pass and offers clearance of 12 inches, which is reasonable for multiple types of surfaces and jobs. Heavy snow may take multiple passes to clear though. The body is made of durable plastic and the whole device weighs a very low 12 and half pounds. It is portable, lightweight, and simple to store because of this. Using the shovel is fairly easy thanks to the one touch power on button. It shifts and can be re-positioned quite simply in the snow. The adjustable metal telescoping handle is a welcome addition as it allows you to find the right height by rotating and sliding it. The secondary handle on the stem is also adjustable so you can get the perfect angle. Toro really went all in with customization making the 38361 a versatile shovel that most people will find comfortable to use. The rust resistant finish is a nice touch too, as is the two-year warranty. The Toro 38361 is unfortunately corded and doesn’t come with an extension cord either. There is a useful cord lock system though that is robust and hard to dislodge in our experience. The motor is near silent meaning neighbors won’t complain if you decide on a nighttime snow clearing session. Overall, a nifty little model with a lot of power for its size. It is deceptively efficient though no match for beefier counterparts at a higher price. We like that the Toro helps to ensure you shovel snow safely. Toro also offers a 12 and 15 amp alternative if you need a larger width and some more power for more troublesome jobs. For a little more money, we delve into the more value oriented range. Among the models available, we gravitated towards the Greenworks 16-inch 10 amp Corded Snow Shovel. It has a 10 amp motor with an impeller capable of clearing around 600 pounds of snow per minute. A large amount given the small motor. The cutting depth is six inches and the clearance width is 16 inches for larger strips of patio and sidewalks. Snow is shifted to a distance of 25 feet though the chute is directed in one fixed position. As with the models above be careful where it is pointing and expect to clear snow twice in some locations. The design is chunkier than our budget models and weighs 26 pounds. Though not heavy by any means, it does require a little more force to work properly so keep this in mind when considering the Greenworks Snow Shovel. The 16 inch width means it remains very much designed for storage, but in a larger sized closet. It is corded and requires a separate extension cord purchase. For thirty dollars more and to save you time, Greenworks offer a value pack that includes an extension cord and the same model. The handle is adjustable, ergonomically designed and includes a cord lock mechanism as well as a flip switch to turn the shovel on. It can be set to three different positions based on your height and wingspan. The grips are rubber coated for maximum grip. The six inch radial wheels designed to cut through snow make movement simple even in thick build ups. We particularly liked the lawnmower style handle that makes pushing that much easier. A value packed shovel with all the features you need to clear snow efficiently. Not the best, but by no means the worst. It remains affordable as well. It also comes with a generous four-year warranty that covers standard home usage. If you desperately need a cordless shovel that demonstrate value for money then we would go for the Earthwise SN74014 40V Electric Snow Shovel. Powered by a 40 volt 4 amp lithium-ion battery and running on a 12 amp brushless motor, the Earthwise can clear up to 300 pounds of snow per minute. It weighs slightly less than eight pounds making it very portable. The snow throw distance is 32 feet with three position discharge vanes that allow you to direct the flow of snow. It’s a rudimentary system that works, yet doesn’t offer the control of more expensive snow blowers. The clearing width is 14 inches and cutting depth eight inches. It handles packed snow better than other models due to the added depth and the width is ideal for little to medium sized surfaces. The augur is a dual blade linked to a curved rotor that works efficiently given the size of the battery powered motor. The battery and charger are included. The design is ergonomic and the two handles are adjustable by way of a bolt system. It has two six inch transport wheels for easy gliding over snow. The single push start button requires that you press down on the safety switch simultaneously. We found this cumbersome at times, notably during longer sessions where hand stress become a small, but annoying issue. It does require some assembly and the instructions are lacking somewhat, though anyone with basic DIY knowledge should fare reasonably well. The battery lasted around 90 minutes on continuous use. Remember to charge it regularly during the summer months to ensure it doesn’t sustain long term damage. 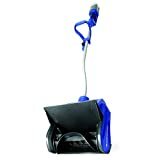 Overall, an all round versatile electric snow shovel with many warranted features. The price remains reasonable and we feel its performance was noteworthy, though not exceptional. Worth a mention is the SN74014 older brother, the Earthwise SN74016 40V Electric Snow Shovel, which is essentially the same model with an 18 inch clearance width. We recommend it for those with a bigger surface to clear with little to no awkward areas. 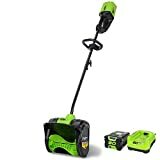 Searching for a cordless and convenient shovel, the Greenworks PRO 12-Inch 80V Cordless Snow Shovel stood out as a reliable option. It’s a lightweight shovel with an 80 volt lithium ion that powers a motor capable of throwing snow up to 20 feet away. The motor is brushless and near silent. It has a cutting depth of six inches and can clear widths up to 12 inches. The Greenworks PRO is compact at 15 pounds and convenient, ideally suited for smaller areas and light, yet settled snow. The design is ergonomic with an adjustable stem and gripped handle. The design is sleek and looks the part. The battery has a 45 minute run time and charges back to 100% in 30 minutes. The charger ships with the shovel. There’s a one push on button with safety lock. A four-year warranty on the shovel and two-year warranty on the battery are a standard part of the package. Overall, a great portable snow shovel with a reliable cordless battery. The only issue was that it didn’t fare too well with ingrained snow and required a little more pressure that we would have liked on certain surfaces. Next up, we liked the Snow Joe iON13SS 40-volt Cordless Snow Shovel. A 40V 4 amp EcoSharp lithium-ion battery powers a 500 watt brushless motor that can shift 300 pounds of snow per minute. The battery uses EcoSharp technology, which guarantees a run time of around 52 minutes. The motor itself is extremely quiet, vibrates very little, and is ecologically friendly given it doesn’t require gas to function. The augur has a double blade design and can throw snow at a distance of 25 feet. The throw is mono directional so be prepared to get some snow on you if it’s windy, and to clear sections again if you happen to direct the spray of snow where you’ve already passed. A scraper blade sits at the bottom of the shovel and helps dig into the snow for a clean clear. The iON13SS cuts to a depth of six inches and has a width of 13 inch making it perfect for sidewalks and wide drives. The shape and design are compact, yet sturdy at only 12 pounds. The patented back-saving handle is adjustable. Though the lack of sufficient padding is noted. Turning on the shovel is easy with the push power on button. It is also equipped with a safety switch for good measure. The battery cover does tend to open during extended use, but this can easily be remedied with a strip of tape wrapped around the top of the battery box. The battery and charger are included with the shovel as is a protective cover for the summer months when the shovel isn’t in use. This is ideal for storage. The two-year warranty is appreciated even though it isn’t as long as some competitors out there. Overall, a nifty cordless snow shovel that may lack some features, but is overall worth the money and does the job well. Though it isn’t technically a snow shovel, it performs many of the same functions and does so with better results. For those that want a performance-oriented solution, we highly recommend the WEN 5662 Snow Blaster 13.5-Amp Electric Snow Thrower. The price is in the same ballpark as the more expensive electric snow shovels on the market so you won’t be paying a premium for the benefits. In addition, using the 5662 isn’t much more complicated than using a standard electric shovel so those fearful of being overwhelmed need not worry. The Snow Blaster is equipped with 13.5 amp motor that is able to shift close to 500 pounds of snow per minute aided by a powerful auger capable of speeds up to 2000 rotations per minute. The whole thrower weighs a hefty 39 pounds in line with the sheer force it produces. The cutting depth is 7.8 inches so even the most intense snowfall has no chance against this model. The cutting width is a very generous 18 inches that works great on wide drives and pathways. It can throw snow up to 20 feet away via a quick-adjust round-mouthed chute that can turn up to 180 degrees so you always dictate where the snow lands. Simply pivot the purpose built crank that extends all the way to just below the power bar for easy access and your set. You can even change the angle of the head with a single button spring-loaded lever to launch snow up to 10 feet into the air. This means you can avoid passing over the same area multiple times, which saves energy and time in the long run. You always know where the snow ends up. The chute itself is designed to minimize blockage and snow accumulation inside the mechanism. The construction is fitted with two six inch wheels designed for movement over snow. The frame itself is collapsible so you can easily fold it up for the warmer months. There is even a carry handle to make transportation easier. The auger is made with a heavy-duty framework with flexible edges to avoid damaging surfaces as you work off the snow. The Snow Blaster is corded, which is to be expected given the immense power it wields. There is a handy cord wrangler on the padded main handle that prevents accidental unplugging and unexpected shutdowns. Much like a lawnmower, the Snow Blaster is controlled with a power bar. Simply pull on it to make the thrower come to life and let go to shut it off. In terms of throwers, it is very light and because of this moving it isn’t too much of an issue. This makes storage a lot simpler. The price is also much lower than most throwers, yet the model doesn’t suffer in terms of efficiency. We liked the Snow Blaster for the straightforward power and adjustable features. Though not a shovel per se, it performanced so well we feel the need to recommend it for those looking to buy an electric snow shovel. A two-year warranty rounds things off and the WEN name is widely respected so you are buying into a trustworthy manufacturer with proven after sales service. Performance always comes at a price. 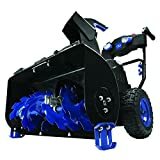 If you are willing to fork out the extra cash, then the Snow Joe ION8024-XRP Snow Blower comes highly recommended from us. As with the model above, it isn’t technically an electric shovel, but is nevertheless very similar with some of the same basic functions. Powered by two interchangeable EcoSharp 40 volt lithium-ion batteries and running a 2500 watt brushless motor, the ION8024 offers close to 40 minutes of uninterrupted, no nonsense run time with very little noise. The run time may seem short, but this model is incredibly powerful and it will be more than enough to clear even the biggest deposits of snow on your property. A gas powered equivalent requires fuel, maintenance and is harmful to the environment making the ION even more attractive. The cutting depth is 13 inches and the clearance width is a huge 24 inches. The motor has a four speed digital drive system controlled by an illuminated display panel with battery gauge indicators so you stay on top of your power levels while clearing snow. The display also shows the set speed setting and direction for even more control. The motor is complemented by a serrated two stage heavy-duty augur and sturdy impeller capable of clearing 1000 pounds of snow per minute even in the harshest environments. This is more than three times the volume of some of the models we covered above. The scraper on the bottom of the impeller ensures surfaces are not damaged even after multiple passes. The snow chute is adjustable to up to 180 degrees and can throw snow up to 32 feet, controlled by an easily accessible switch near the power bar. There are two integrated lights which are ideal for overcast and even nighttime sessions. The power bar is equipped with two ergonomic trigger grips that power on the blower with one simple push. The grips are comfortable and translate little of the vibration from the motor. The two heavy-duty TracAssist tires provide reliable traction on snow as well as ice. Overall, this is the most powerful and most expensive option on our list. The price matches its efficiency and we don’t recommend this for the infirm or those unversed in powered snow clearing products. It ships with a comprehensive two-year warranty, protective cover and a dual bay iCHRG40-DPC charger for the batteries. For nighttime use we recommend a shovel that performs quickly and efficiently with minimum fuss. For these reasons we recommend going for a thrower for the added power. Our choice is the Snow Joe Ultra SJ623E 18-Inch 15-Amp Electric Snow Thrower with Light. Under the hood it has a corded 15 amp motor that powers a four blade heavy-grade steel augur capable of shifting up to 720 pounds of snow per minute. This power range is akin to that found in gas powered alternatives making the SJ623E the machine of choice for the environmentally conscious consumer. The SJ623E has a clearance width of 17 inches and a cutting depth of 10 inches. These characteristics mean it can tackle medium sized jobs down to the ground very quickly with one pass. The chute throws snow up to 25 feet away and the direction is adjustable to up to 180 degrees thanks to a crank that runs up to the grips. There’s even a chute cleaning tool that attaches to the frame for ease of access in the unlikely event of a blockage. The scraper on the base cuts away snow without scratching surfaces. The design is fairly compact given the power of the SJ623E and the manufacturer has provided a well-thought out build thanks to the ergonomic grip, foldable handle for easy storage, and easy access safety switch. There’s even a cord clasp to avoid accidentally unplugging it during use. The start button is close by and requires one touch to power up the thrower. There’s virtually no delay between touching it and the machine springing to life, ready to deal with the snow. The easy glide wheels work well on snow for exceptional manoeuvrability given the weight. Of great interest for nightly sorties is the integrated 20 watt halogen headlight that is powerful enough to light up even the darkest of nights. Overall, the power of the motor and the luminous headlight make it ideal for nighttime use. The extra features round it off nicely. The only real downside is that it doesn’t ship with an extension cord. It undoubtedly beats using a snow rake or shovel.